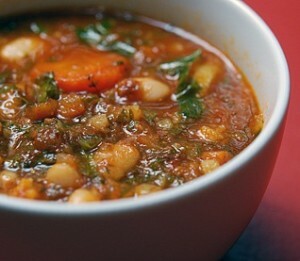 Minestrone: Minestrone is a thick soup of Italian origin made with vegetables, often with the addition of pasta or rice. Common ingredients include beans, onions, celery, carrots, stock, and tomatoes.There is no set recipe for minestrone, since it is usually made out of whatever vegetables are in season. Add the onion, carrots, celery, pancetta, and garlic. Sauté until the onion is translucenttakes about 10 minutes. Add the Swiss chard and potato. Add the tomatoes and rosemary sprig. Simmer until the chard is wilted and the tomatoes break down, takes about 10 minutes. Blend 3/4 cup of the beans with 1/4 cup of the broth in a processor until almost smooth. Add the pureed bean mixture, remaining broth, and Parmesan cheese rind to the vegetable mixture. Simmer until the potato pieces are tender. Stir in the whole beans and parsley. Simmer until the beans are heated through and the soup is thick. Add salt and ground pepper, as per taste. Remove and discard Parmesan rind and rosemary sprig. Ladle Minestronesoup into bowls and serve.